Gonepteryx rhamni (known as the common brimstone) is a butterfly of the family Pieridae. It lives throughout the Palearctic zone, commonly found across Europe, Asia, and North Africa. The common brimstone is highly mobile and utilizes various environments for different stages of its life cycle. The butterfly inhabits wetlands during mating and breeding season, as they provide ideal areas for oviposition due to an abundance of host plants like the alder buckthorn. 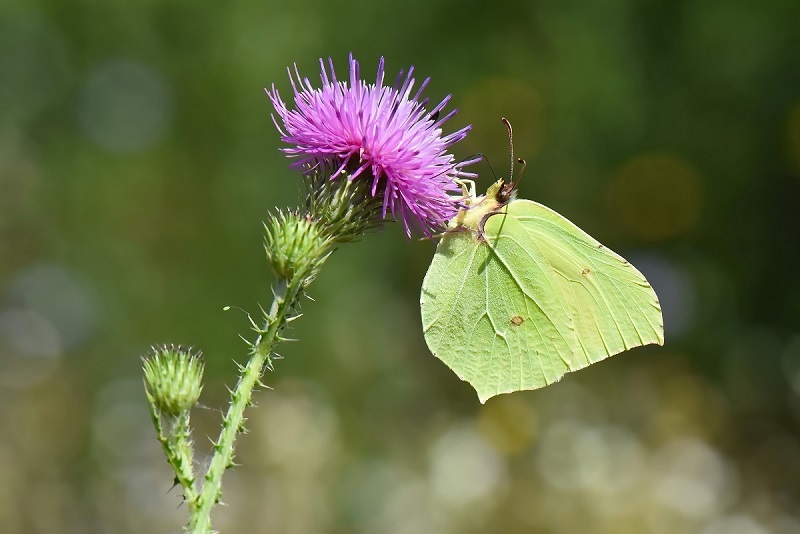 The common brimstone prefers laying eggs on younger host-plants with late bud-bursts that are isolated from other plants in the area and exposed to both open space and sun. During the winter, adult brimstones travel to woodlands to hibernate, as they provide ideal overwintering sites with shelters such as evergreen foliage and holly. the wings may this create more charming colours. The height of beauty, nice shot. Beautiful picture of this Brimstone butterfly. Well background and exposure. Like background bokeh. Cropping could have been more attractive than although it's my personal opinion. I'll post a WS later if you don't mind to show how I would like to frame this beautiful butterfly. Always beautiful this Gonepteryx and the picture is great!